A small section West Broad Street, east of City Hall, will be closed to through traffic from November 16th through November 23rd. Access to City Hall will be limited to only the west side, coming from the Whitehead Road roundabout. In order to access City Hall from the Alton Tucker side of West Broad, you will have to follow a small detour. There will be limited access to The Suite Spot from the Alton Tucker side of West Broad. 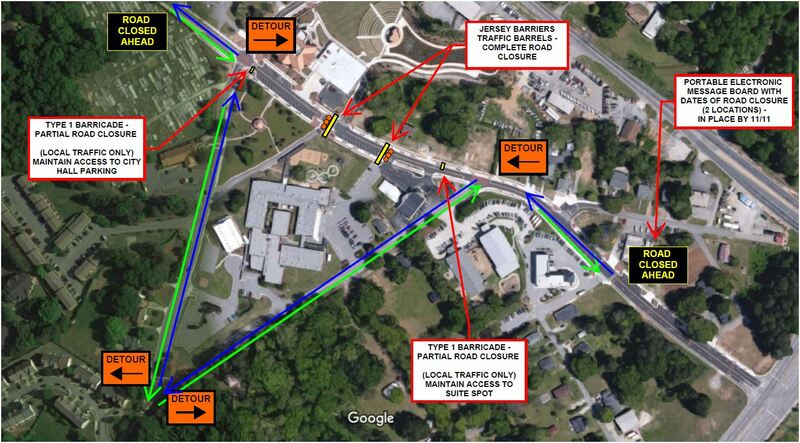 The detour, shown below in green, will be clearly marked and should only be in effect for one week. If you have any issues or comments, please contact Tim Schick, 770-945-6716. Thank you for your patience as we move forward in the exciting EpiCenter project.